Is Commercially Sold Almond Milk Damaging Your Health? The answer is YES, it stresses your immune system and contributes to chronic disease. 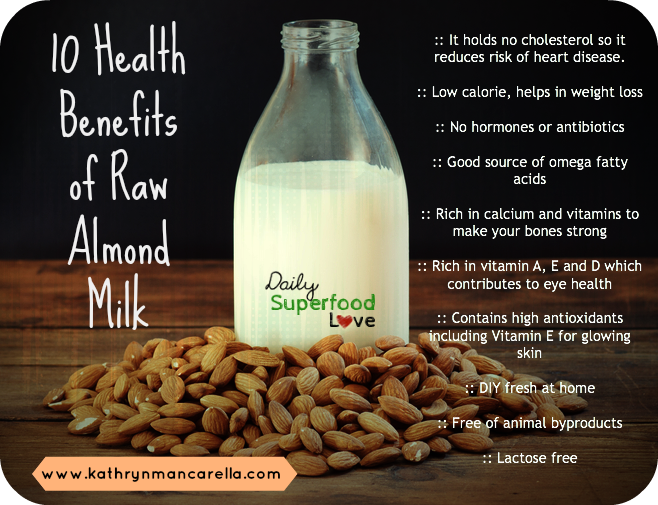 Read on to find out why you should only drink homemade Almond Milk. Calcium Carbonate – This is a non organic, non-living mineral source of calcium and, most of the time, it is just plain chalk! That’s right- you are consuming chalk – the same stuff you use to write on a blackboard. Good luck with that! Tocopherol Acetate – This is a synthetic man-made version of vitamin E. Studies have repeatedly shown that the human body prefers natural Vitamin E because it retains it at healthful levels while working to quickly excrete synthetic vitamin E.
Synthetic Vitamins Are Not Nutrients! Our digestive system does not recognize synthetic man-made vitamins as food. When you ingest a synthetic supplement, such as the ones found in “almond milk”, your body reacts as if you have swallowed some foreign toxic chemical. This means that your immune system must combat the enemy invasion. If you keep stressing your immune system in this way it will eventually become too weak to protect you from illness or disease. Lastly, since the very beginning of the boom in the supplement industry which included “fortified” and “enriched foods”, the scientific community has known, researched, and shown with every study that synthetic supplements weaken our health. In fact, these chemicals found in your “almond milk,” bread, and cereal boxes are not absorbed nor utilized by your body – instead they act as a burden to your health, even causing withdrawal symptoms when you eliminate them from your diet. Nothing replaces whole food, naturally occurring nutrients that your body naturally recognizes, absorbs, and utilizes as nourishment. *For more information on all of the synthetic nutrients that you find in your everyday packaged foods I highly suggest that you pick up a copy of “Supplements Exposed” by Dr. Brian Clement. Also, you can read more warnings from the Organic Consumers Association regarding how isolated synthetic vitamins are not recognized or metabolized by the body in the same way as the naturally occurring versions. Other than toxic synthetic vitamins and minerals, your typical carton of store-bought “almond milk” also contains additives, preservatives, and added sugars. Even if you purchase what claims to be an unsweetened and organic product it will still contain the harmful chemicals that are a disaster for your body. Simply put, there is no healthy choice for almond milk that exists on supermarket shelves today.